Macrobid is an antibiotic that is prescribed for cystitis and other urinary tract infections. The active substance is nitrofurantoin, an anti-bactericidal medication that is rapidly and almost completely excreted by the kidneys. This makes Macrobid ideal to control acute, uncomplicated urinary tract infections. The drug is sometimes also used to prevent infections during an examination or after a surgery of the urinary tracts. 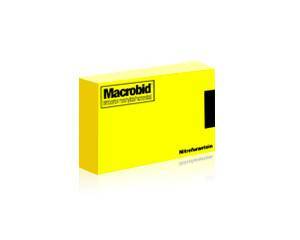 Macrobid is available in packages containing 14 capsules of 100 mg. It is best to take the capsules with some fluids during or right after a meal, and have to be swallowed in its entirety. It is important to complete the treatment, even if the symptoms have disappeared. Early discontinuation of the treatment may cause the infection to return. If symptoms persist after the treatment, or do not improve or recur, consult a doctor. The usual dose for adults and children over 12 years is 100 mg 2 x daily for 7 days. However, always follow the advice of your doctor. You can catch up with a missed dose, unless it is almost time for another dose. An overdose usually leads to vomiting. In the event of an overdose, always warn a doctor. Medications may cause side effects. The most common side effects that were reported about Macrobid are: headache, dizziness, drowsiness, nausea, diarrhea and abdominal pain. Macrobid may darken the urine. This is harmless and will eventually disappear after the treatment. In rare cases, serious side effects may occur such as coughing, shortness of breath and fever (the chance is high after prolonged use of this drug), rash or tingling in arms and legs.In these cases, stop using the medication and consult a physician. If you experience many side effects or notice any other effects that is not listed, consult with a doctor or pharmacist. Macrobid may reduce the effectiveness of other antibiotics. Also, antacids, some diuretics and drugs prescribed against gout may affect the action of Macrobid. Always inform the doctor when you use other medications. Patients with a G6DP deficiency (a form of anemia). Macrobid is not suitable for children under the age of 12. Macrobid can, after consultation with a doctor, be used during pregnancy. However, it is not advisable to take this medication before delivery: newborn babies are not able to break down the active substances and may become sick. Macrobid ends up in breast milk in small amounts. Consult the doctor about the use of Macrobid during breastfeeding. Macrobid may cause dizziness. It is important to take this into account when participating in traffic and / or working with machinery.